It’s hard enough to tell how deep you’re drilling with rotary hammers when you’re drilling downward or sideways, but drilling overhead makes it even more difficult. Try “feeling” your way to a perfect depth while your arms burn like mad. DeWalt claims to feel your pain, which is why they just launched a depth control system — you know, to remove the guesswork. The cap you see in the picture above mounts to the bit and serves as a stop to keep you from over-drilling. You can adjust its size by twisting it then locking it in place. Seems pretty simple. 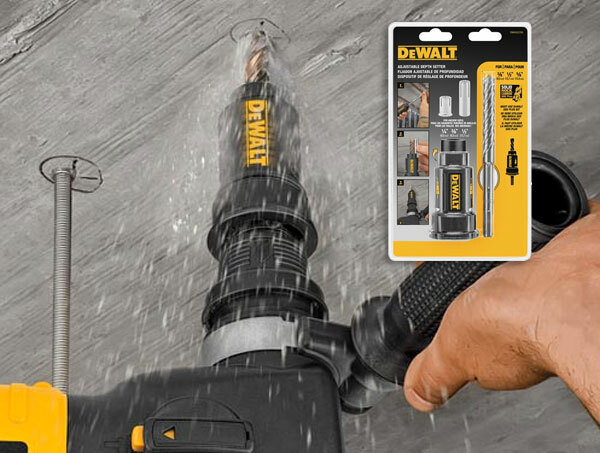 A couple of caveats: First, if I’m reading the press release correctly, it’s designed for use only with DeWalt’s own proprietary SDS Plus bits — kind of a downer if you’re already stocked up. Then again, I’m betting that anyone who drills enough to benefit significantly from saving a few seconds drilling each hole — DeWalt envisions these as a time-saver for folks who do a lot of repetitive fixed-depth drilling, like installing drop-in anchors or other plumbing/electrical fixture mounts — probably chew through enough bits to offset that issue. And a quick check shows little difference in pricing between DeWalt’s bits and competitors’. We didn’t see it in stock yet (hey, they just announced the thing today), but expect to pay around $30 for one when they come available. I’m a little confused as to what about this is proprietary? SDS Plus isn’t proprietary. Many brands of rotary hammer use that type of shank. Also, what’s the advantage to this, as opposed to the more common sliding metal rod attachment to control depth? Repeatedly smacking a peice of plastic attached to the bit, into concrete, seems like a step backward, doesn’t it? Maybe I’m missing something here? Or you just use a fraction of a cents worth of masking tape and don’t have another crappy accessory to break or lose. I can see where this would be useful but for the amount of blind hole drilling I do masking tape is fine, or a caliper if it needs to be really accurate. I’m with Daniel. Tape is cheap, ubiquitous, and lightweight. Yeah, I have to agree, or just a piece of wood with a hole drilled in int, slid over the shaft…. Not to mention the fact that this would at least triple the time it takes to change the bit, which is the most agrivating part of this type of drilling. The rod type depth-stop is the simplest IMHO. This would be a waste of money for anyone. I have drilled thousands of holes in concrete over the years. Tape on the bit works the best. It may not fit in the hammer drills case, so it may not even get back to the shop or tool crib. FWIW, Pete, they actually did produce a new dust collection system at the same time. It was mentioned in the same press release, but I’d planned on writing about it separately since this seemed more different from the competition’s stuff. I appreciate all the interest and feedback on the NEW adjustable depth setter and dust collector. When researching the project we found that controlling depth was very important when installing drop-in anchors, especially due to the associated risks with hitting post tension cable. The adjustable depth setter allows the end-user to set the drilling depth to a specific anchor length before drilling, providing less downtime for the end-user. In addition, the dust collector fits over the adjustable depth setter minimizing the dust and creating a clean workspace. Check out the demonstration video on http://www.dewalt.com/accessories .